While your move-in momentum is still going full-force, this is the time to plan at walk-through in your new home and make a list of any simple maintenance to-do items. It’s true the home inspector checked for the signs of anything significant but chances are you will find some smaller maintenance fixes you would like to make. Things such as checking your insulation and how thick it is. Did you know that adding an insulation blanket around your hot water heater will save you money? The blanket keeps the water in the heater hot over longer periods of time so the heater won’t need to work as hard. The added insulation keeps it from not turning on to reheat warm water, saving you dollars. It’s little things such as this where new homeowners can find savings shortly after moving in. Let’s take a walk around your home and property to spot more money saving opportunities just waiting for your attention. Each maintenance fix plus ways to reduce your home’s energy usage saves you costs, keeping your money in your pocket. Hot Water Heater: As mentioned earlier, add an insulation blanket around the hot water heater to maintain the heater’s water temperature for longer periods of time. If your water heater already has a blanket give it a check to ensure it’s not showing any wear or tear. If it is, replace it. While you’re checking the hot water heater, take a moment to lower the temperature to 120 degrees Fahrenheit. This optimum temperature will produce a comfortable shower temperature without being too hot to scald you or a child. 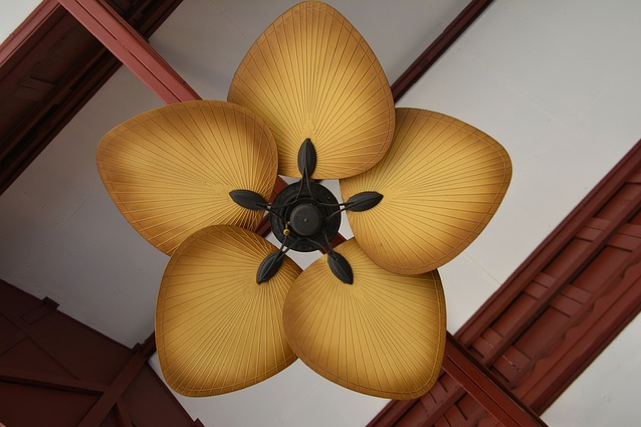 Ceiling Fans: If you have the ceiling height to install a ceiling fan, do it. It’s true, the installation of a ceiling fan circulates air and saves on both cooling and heats costs. Fans are a low-energy way to keep the air moving and keep your thermostat settings several degrees lower. During the summer the air should be blowing downward and for the cooler winter months reverse the blades rotation to pull the air upward to warm a room. Insulation: A well-insulated home has many areas which work together to save on the energy bill. You now know how adding a blanket around the water heater helps. This same practice works for adding insulation around exposed water pipes. Exposed hot water pipes lose heat as the water moves through and crosses greater distances from the hot water heater until it reaches a faucet, shower, or tub. Wrap the pipes and keep the water hotter for longer. Check the insulation levels between walls and in the attic or crawl spaces. The insulation adds an additional layer between you and the cold. A well-insulated home will allow you to run the thermostat on a lower setting and you will see a lower utility bill. Cracks & Air Leaks: While you’re checking the insulation-levels keep an eye for any cracks or air leak problems. These types of leaks will let warm air out and the cold in which also becomes money leaks. Pay special attention to space around doorways, windows, electric outlets (look under the outlet plate for gaps), around plumbing under the sinks, and any cracks in the basement or garage due to settling of the foundation. With some weather-stripping and caulking, you can seal these gaps and keep your energy bills in check. Energy Efficient Appliances: If you need to purchase new appliances for your new home, consider energy efficient appliances. Or, if your appliances have been with you for many years and are showing their age plus some wear make plans to buy new energy-star rated replacements. It’s much cheaper over the years to steer away from the former energy guzzlers. We hope you’ll take advantage of these savvy ways to put money back in your pocket shortly after purchasing your home. If you have any questions, don’t hesitate to contact our office. Michelle Knobloch brings a wealth of knowledge and expertise about buying and selling real estate around the Baton Rouge region to those she serves. Michelle is a multi-year award winning real estate listing specialist and CEO of Capital Homes Specialists where her clients trust her to have up-to-date information on the real estate market. When it’s time to buy, sell, invest, or relocate speak with a trusted professional knowledgeable in the homes and neighborhoods of Baton Rouge and the surrounding parishes.